The softest, smoothest bodysuit you've ever felt, making it perfect next to baby's skin. These plain bodysuits are perfect for crafting, personalized bodysuits, decorating or for the many times a day that mom changes baby's outfit. Available in almost 30 different kid pleasing colors including school colors and options for teams, daycares, resorts and more! 4.5 oz. 100% combed ringspun cotton (Heather is 93/7) jersey. Flatlock seams. Double-needle ribbed binding on neck, shoulders, sleeves and leg opening with EasyTear™ label. Reinforced three snap closure. White is sewn with 100% cotton thread. Q: What brand is this bodysuit? Thanks! A: This is rabbit skins by LAT. 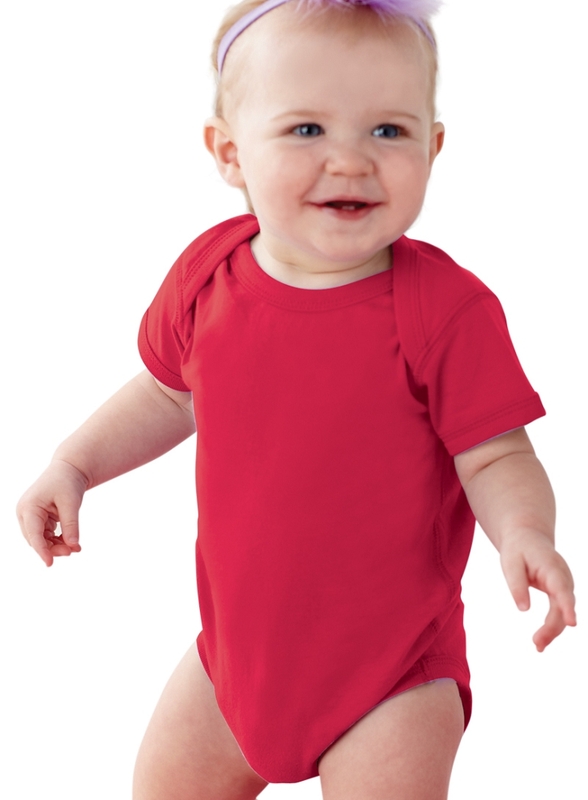 Q: I would like to buy mixed sizes and colors and some of the Velcro bibs. How would I order it online? A: You can order online buy visiting http://www.wholesaleblankclothes.com. Plus, you can mix and match colors and sizes to get the best quantity pricing. If you are having an issue ordering online then you can call us toll free at 800-707-9692 M - F 9AM to 4PM Pacific and we can take the order for you.